Good Drno from Rocks Off, made a back-cover which was not included in the torrent. Just finished downloading...I like what I hear! @His Majesty: Thanks for sharing...very much appreciated! @open-g: Thanks for the quick sound engineering & uploading job! Edited 2 time(s). Last edit at 2008-11-15 01:38 by Live!. Many thanks to everyone involved in getting this recording out. For those of you who havent downloaded much before, please stay on after completing the download to help others get their copy downloaded faster. Just listening to it now, for an audience recording this is terrific! Many thanks to all involved - well worth the wait! As I said, U Rock! Who would have thought my first post would result in the unearthing of this wonderful recording! Thanx to all involved! I have not been around here that long but I read the enite thread. That was quite a trip. His Majesty is a very cool dude. Thanks a lot to everybody involved - it sounds amazing and was well worth the wait. Edited 1 time(s). Last edit at 2008-11-13 14:00 by sway666. will download tonight! Thanks a lot to everybody involved! Thanks open-g, His Majesty, all the bumpers and everybody else! Keith if you read me... Have you the answer ? 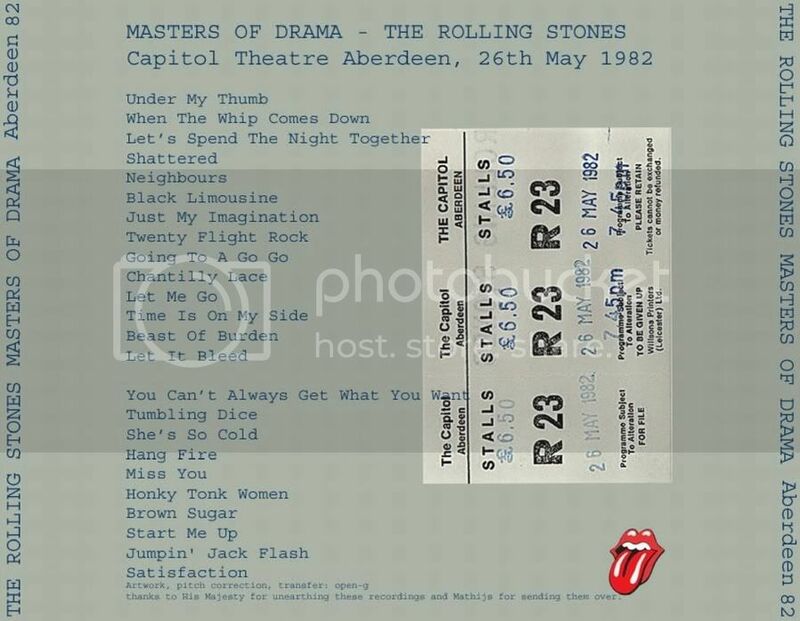 Another local resident has told me he recorded the stones at a gig in Glasgow in 1966 and still has the original reel to reel tape and the revox machine he recorded it on! I'll believe it if I get to hear it! Any known recordings circulating from their 1966 UK tour? Edited 2 time(s). Last edit at 2008-11-13 20:47 by His Majesty. Now THAT would be a even bigger find IMO! Theres so little from that Stones period (other than radio bcasts) that is decent enough quality to enjoy. See what comes of it, I hope it's true and that he'll give me a copy! Can't imagine someone getting an old valve revox in to a venue undetected though huh!? I'm skeptical, but hopeful. We talked about two weeks ago, but I didn't want to say anything till the aberdeen gig was out there incase people think I'm in the habit of making stuff up or something! Royal reputation is at stake here! Edited 1 time(s). Last edit at 2008-11-13 21:03 by His Majesty. Could be true very well - in those days they didn't suspect the audience to smuggle tech into the venues. some kids might have got their ice-creams confiscated. hey, I'd be ready for that if you get hold of it - anyday. btw, have you got your flac copy of this one yet? if not, send me a mail. My brother-in-law recorded Vienna 1967 on an Uher machine and he had two friends helping him to bring all the stuff in as he recorded all groups - so he needed (I think) 3 reel-to-reel tapes and plenty of accus to keep the Uher going. Don't forget - back then it wasn't (at least on the continent) forbidden to tape shows and he made hours and hours of recordings. Sad, but only 1 Stones-show..
Wow, crazy stuff! Ok, I'm optimistic about this being true now! Whether he'll give me a copy and give permission to post it is another matter though! Can someone upload Vienna 1967, I don't have that gig! I'm aware that it's meant to be pretty poor quality though, I don't care, the 67 tour is my fav! Edited 1 time(s). Last edit at 2008-11-13 21:39 by His Majesty. I'm pretty sure someone put it up in the Hot Stuff fairly recently. 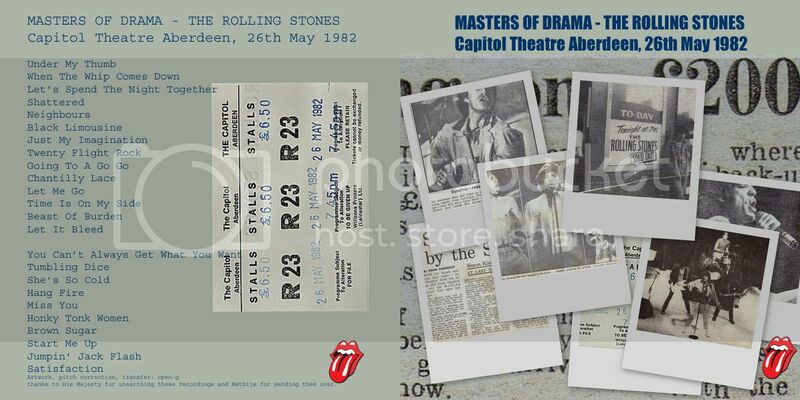 Anyway thanks to everyone involed in getting this Aberdeen show out, especially His Majesty and open-g...and thanks to whoever taped it 26 years ago. Does he still have that tape? I remember Vienna '67 being awfull sound, and an upgrade would be fantastic! I have just listened through the first disc of Aberdeen 1982; very enjoyable quality. And just like Glasgow; May 27th (new tape discovered last year); it's a very good performance - "Time Is On My Side" doesn't come short of the famous Hampton 1981 version. It's strange that/if Keith skipped Little T&A as his voice sounds great for the backup-vocals. Maybe he felt that his voice wasn't rough enough for the hard-hitting Aberdeen audience?? And oh yeah; His Majesty - please check out Glasgow 1966 further; it would be a sensation - nomatter what the quality is like. Nothing could top such a discovery...well maybe Glasgow 1971; but that's about it. 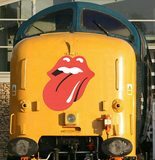 That is such a magical period and(not to put Mick T or Ron down at all)I think if there were more available lots of people who maybe didnt experience the original Stones would get better insight! Too bad someone couldnt get a club recording like The Beatles Star Club of the Stones, just for the quality. By the 65-67 venues it was SO loud with screaming and as I'm sure someone here could tell us about the quality(or lack of) the PA systems used in the early days? Did they even really "mix" anything? Just some interesting points to ponder. I haven't asked him about his 70's stuff yet.